The EMU 1212M V2 will not give you the versatility and flexibility of the Â£600-Â£1500 range sound cards, it will however offer good value for money. 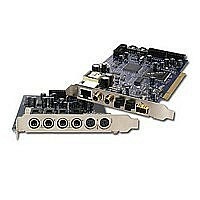 At the Â£100 price tag this is one of the cheapest and most powerful PCI solutions for quality sound and smooth performance. The retail box contains the E-MU 1010 PCI card, E-MU 0202 I/O daughter card, I/O card cable, a Mini-DIN MIDI adapter cable, the Quick Start installation guide and the E-MU Digital Audio Systems CD-ROM (Windows 2000 and XP Drivers, E-MU PatchMix DSP, E-MU Power FX, E-MU E-DSP, effects library and the Owner's Manual and Tutorials).